Kids will love these festive red, white, and blue popsicles for 4th of July and you'll love how easy (and healthy!) they are! The striped layers are made with fresh blueberries, vanilla yogurt and watermelon - no added sugar or food coloring. They're an icy treat you'll feel good about giving to your kids. Step 1. In a blender, add blueberries and 5 tablespoons yogurt; puree until smooth. Step 2. Divide blueberry mixture among the ice pop molds, filling them about a third of the way. Step 3. Freeze 1 to 2 hours. 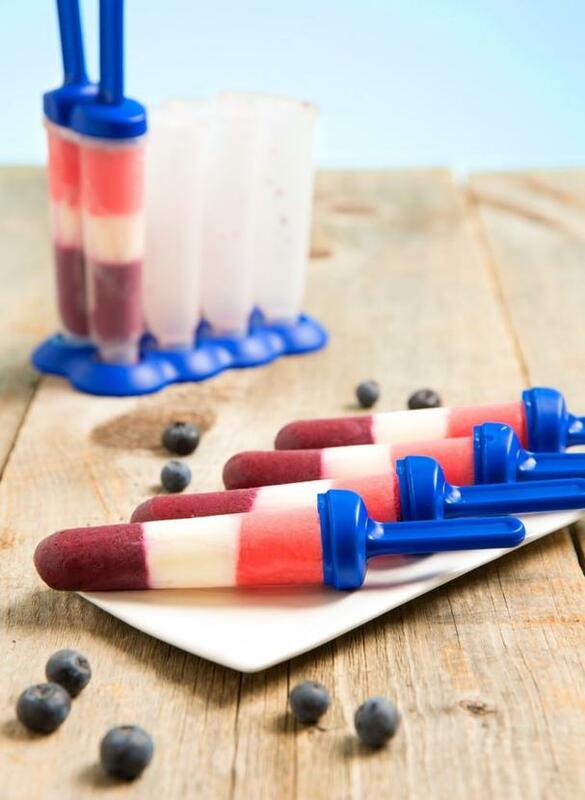 Add a layer of 2 tablespoons yogurt on top of frozen blueberry layer to each ice pop mold. Step 4. Freeze 1 hour until almost completely frozen. In the meantime, in a blender, puree watermelon and 1 tablespoon yogurt. Step 5. When the yogurt layer is almost completely frozen, add watermelon mixture to form top layer of the ice pops. Step 6. Push in the pop handles. Freeze another 1 to 2 hours.